The ocean is a hostile environment for man-made equipment, no matter its purpose. Whether commercial fishing, scientific research, or military operations, salt water is constantly working to break them all down. The ocean is also home to organisms well-adapted to their environment so DARPA is curious if we can leverage their innate ability to survive. The Persistent Aquatic Living Sensors (yes, our ocean PALS) program is asking for creative ideas on how to use sea life to monitor ocean activity. Its basic idea is simple: everyday business of life in the ocean are occasionally interrupted by a ship, a submarine, or some other human activity. If this interruption can be inferred from sea life response, getting that data could be much less expensive than building sensors to monitor such activity directly. Everyone who applies to this research program will have the chance to present their own ideas on how to turn this idea into reality. The program announced it will “study natural and modified organisms” (emphasis ours.) Keeping an open mind to bio-engineering ideas will be interesting, but adding biohacking to the equation also adds to the list of potential problems. While PALS will keep its research within contained facilities, any future military deployment obviously will not. Successful developments in this area will certainly raise eyebrows and face resistance against moving beyond the lab. But such possibilities are still far away in a future that many never arrive, as is common with DARPA initiatives. Very recently we talked about their interest in brain stimulation and we’ve been fascinated by many DARPA initiatives before that. If PALS takes off, their living sensor nodes might end up face to face with the open-source underwater glider project that won this year’s Hackaday prize. Rice is cultivated all over the world in fields known as rice paddies and it is one of the most maintenance intensive crops to grow. The rice paddy itself requires a large part of that maintenance. It is flooded with water that must be kept at a constant level, just below the height that would keep rice seedlings from growing but high enough to drown any weeds that would compete with the rice stalks for nutrients. This technique is called continuous flooding and a big part of the job of a rice farmer is to inspect the rice paddy every day to make sure the water levels are normal and there are no cracks or holes that could lead to water leakage. This process is labor intensive, and the technology in use hasn’t changed much over the centuries. Most of the rice farmers in my area are elders with the approximate age of 65-70 years. For these hard working people a little bit of technology can make a big difference in their lives. This is the idea behind TechRice. [Kasey] and [Guyzmo] have been working for the past couple of years on a side project that lets them monitor pollution using a network of sensors. They’ve just decided to make the project open source, both hardware and software. The details of the system are available at their GitHub repository. There are two main components to the system. 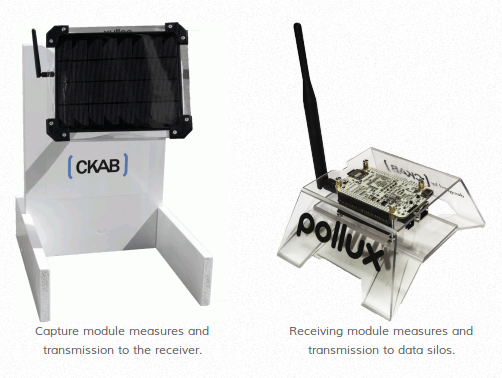 On the right is a base station which collects the data from the array of sensor, one of which is shown on the left. Each sensor runs off of a battery, but features a PV solar panel which keeps the power source topped off. It uses an Arduino to drive the system, and an XBee radio for communications. Some info about the sensors can be found on this summary page. There’s a PM10 particle pollution sensor, temperature, sound, nitrogen, and oxygen sensors. We also wonder if any data can be gleaned from how much electricity the solar panel is able to harvest? The base station also uses an XBee radio to poll the network, but it’s not driven by an Arduino. They’ve gone with the ARM-based BeagleBone to manage the data. [Travis Goodspeed] posted a preview of what he’s working on for this Summer’s conferences. Last weekend he gave a quick demo of sniffing AES128 keys on Zigbee hardware at SOURCE Boston. The CC2420 radio module is used in many Zigbee/802.15.4 sensor networks and the keys have to be transferred over an SPI bus to the module. [Travis] used two syringe probes to monitor the clock line and the data on a TelosB mote, which uses the CC2420. Now that he has the capture, he’s planning on creating a script to automate finding the key.